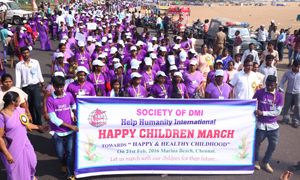 DMI was selected to implement Child line programme as a Nodal Organization in Nagapattinam since February 2011. 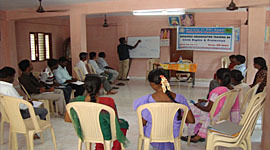 DMI- Childline Nodal Organization conducted resource building training programme titled “Resource Bridge building, Child Rights and protection” on 28.03.11 at DMI. 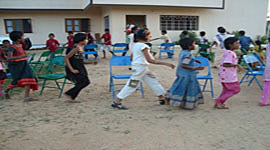 The NGO representatives from 15 leading NGOs and Children’s Home participated in the training program. Sr. Arokia Mary DMI gave a special address to the NGO participants and Mr.Mani from AVVAI Childline briefed about the Childline functions. During the training program the participants were sensitized towards the child Rights violations prevailing in Nagapattinam district. The participants learned the Child way approach, factor of children’s openness; bridge building for tapping the optimum resource and learned methods of collective efforts to success. There were a few pathetic case studies presented by the groups that were critically reviewed by the resource person Mr.Ravichandran, Madurai. A meeting on child-line was organized by Bedroc on 05.04.11 with other leading NGOs. During the Meeting Ms.Mari Suzuki, Chief Program officer, Asian Community Trust (ACT) briefed about their organization and their services. She also instructed about the proposal guidelines and the concept note. She requested the likeminded organization to submit the concept note and proposal for any one of the interested area. Child-line India foundation organized training about the Child-line and other legal aspects from 04.04.11 to 08.04.11 at PMSSS-Pondicherry. Totally, 25 Staff from PMSSS-Pondicherry, Hand in hand and 4 City in charge participated in the training program. The participants learned different types of Call and call category, importance of documentation, Intervention protocol, Outreach , open house and awareness, Juvenile Justice Act 2006 , Child Beggary Act-2000, Role of CWC and JJ board, City Action plan, City Mapping etc., during the 5 days training. 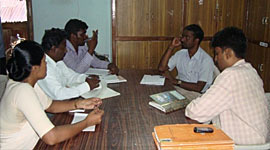 The Coordinator and Directors’ meeting was held on 4th August 2011 at Avvai NGO in which new city coordinator was introduced. He conducted the meeting with coordinators of collaborating NGOs together with director and discussed about the monthly programme and CAB Meeting with district collector. 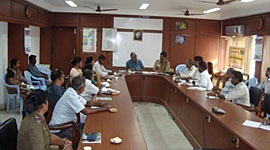 Child-line Directors meeting was held on 6th of September 2011 at DMI Office Nagapattinam and on 7th CAB (Childline Adversary Board meeting) at collector’s office, with the head of all the important departments. 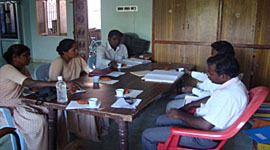 The previous year report was read and the agendas were discussed. The collector instructed the concerned departments to do the needful.